Tao, J., Chen, S. and Zhang, J. (2016). Simple Methods for Screening and Statistical Analysis of Leaf Epidermal Cells in Dicotyledonous Plants. Bio-protocol 6(17): e1916. DOI: 10.21769/BioProtoc.1916. Tao, J. J., Cao, Y. R., Chen, H. W., Wei, W., Li, Q. T., Ma, B., Zhang, W. K., Chen, S. Y. and Zhang, J. S. (2015). Tobacco translationally controlled tumor protein interacts with ethylene receptor tobacco histidine kinase1 and enhances plant growth through promotion of cell proliferation. Plant Physiol 169(1): 96-114. Leaf epidermal cell size and number are positively correlated to leaf area. Stomata are specialized epidermal cells vital for gas exchange and water transpiration. So, observation and statistical analysis of the leaf epidermal cells are valuable for the study of leaf development and response to environmental stimulus. The classical method is using the scanning electron microscope (SEM), which is an expensive and time-consuming method, thus makes the large-scale screening of epidermis impractical. Here we provide simple but effective methods (agarose-based epidermal imprinting and tape-based epidermis tearing) for solving this problem without using the SEM. 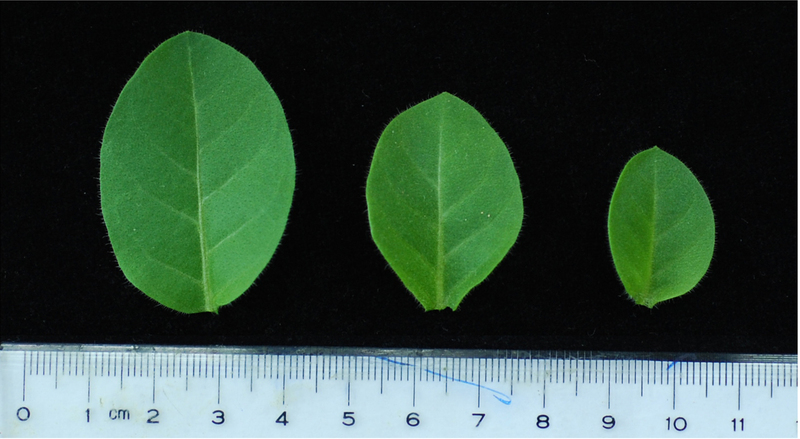 Leaves for screening of epidermis are photographed with a digital camera (Figure 1). The total Leaf Area (LA) is measured using ImageJ. For measuring area using ImageJ, use the straight lines tool to create a line selection corresponding to the scale ruler, and enter that distance in the Analyze > Set Scale dialog box to set the scale. Then use the Polygon selections tool to encircle the target region, and press the M key to measure the area. Figure 1. A photograph of leaves used for screening of epidermis. Leaves with a scale ruler were photographed with a digital camera. Leaf area was measured using ImageJ. For statistical analysis of leaf epidermis, leaf is divided into several parts along leaf veins (Figure 2), and the area of each leaf part (ALP) is measured using ImageJ. Figure 2. Leaf partition for screening of epidermis. 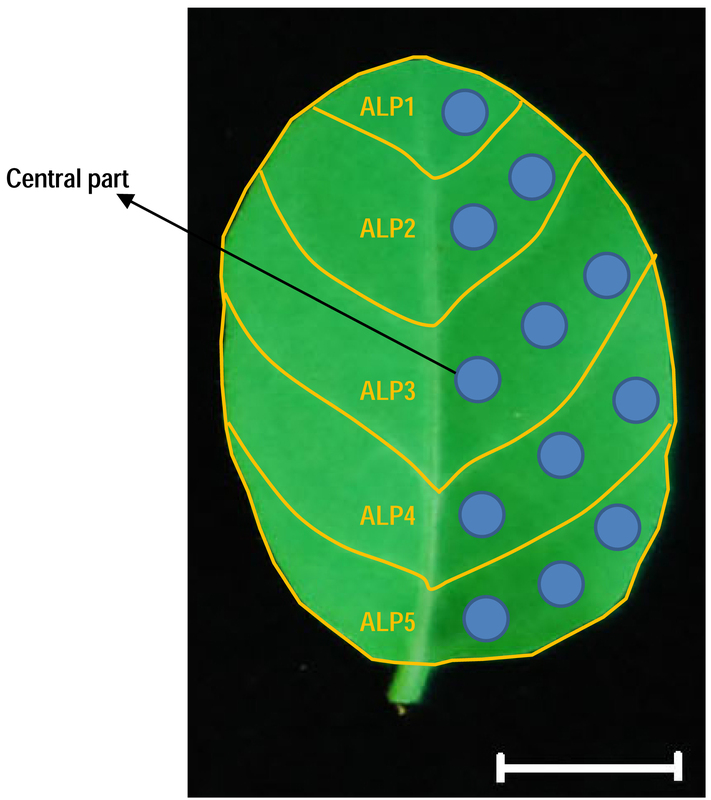 For measuring the epidermal cell size and number, leaf (tobacco) was divided into several parts (partitioned by yellow lines), and the area of each leaf part (ALP) was measured using ImageJ. Blue cycles indicate the leaf pieces selected for observing epidermis. Arrow indicates the central part selected for screening of stomata. Bar = 2 cm. One to three leaf pieces (must be uniformly distributed) in each leaf part are selected for observing epidermis using the following methods (Figure 2). 3% agarose solution is melted thoroughly in a boiling water bath (about 10 min for 50 ml solution) or in a microwave (30 sec for 50 ml agarose solution under 1,000 W) and kept in a 40 °C water bath. Agarose is laid on the surface of a clean glass slide with a pipette to form a thin layer (about 1 mm thick) (Video 1). Leaf blade to be observed is quickly and gently laid on the agarose layer (Video 1). Put the slide immediately at 4 °C for 3 min in a refrigerator. The leaf blade is carefully peeled off using a pointed tweezer (Video 2). The specimen is observed and photographed under the optical microscope (Figure 3). Scotch tape is cut to pieces (about 0.3 x 0.3 cm). Adhere a tape piece tightly to the leaf blade with proper pressure but avoid crushing the epidermis (Video 3). Tear off the strip carefully from one side using a pointed tweezer (the epidermis is sticking to the tape) (Video 3). If massive mesophyll cells adhered to the epidermis, they can be gently scraped off from one side using a tweezer. The epidermis strip is immersed in distilled water on a glass slide, avoiding bubbles (Video 3). The specimen is observed and photographed under the optical microscope (Figure 4). Three regions (50-100 cells) in micrographs of each leaf piece are selected using the Polygon selections tool in ImageJ (Figure 3). The region area is measured, and cell number is counted. Calculate the Cell Size of each leaf Part (CSP) (divide the total area of all regions selected in each leaf part by total cell number of all regions). For measuring the stomatal density and the stomatal aperture, the central part of each leaf is selected for observing epidermis using the methods described in step 4 or 5. Three regions (20-50 stomata) in micrographs are selected using the polygon selection tool in ImageJ. The region area is measured, the stomatal number is counted, and the stomatal density is calculated (dividing the stomatal number by area). The stomatal width and length are also measured using the Straight lines tool in ImageJ, and the stomatal aperture is calculated (divide the stomatal width by the stomatal length). Figure 3. Screening of leaf epidermal cells by agarose imprinting. 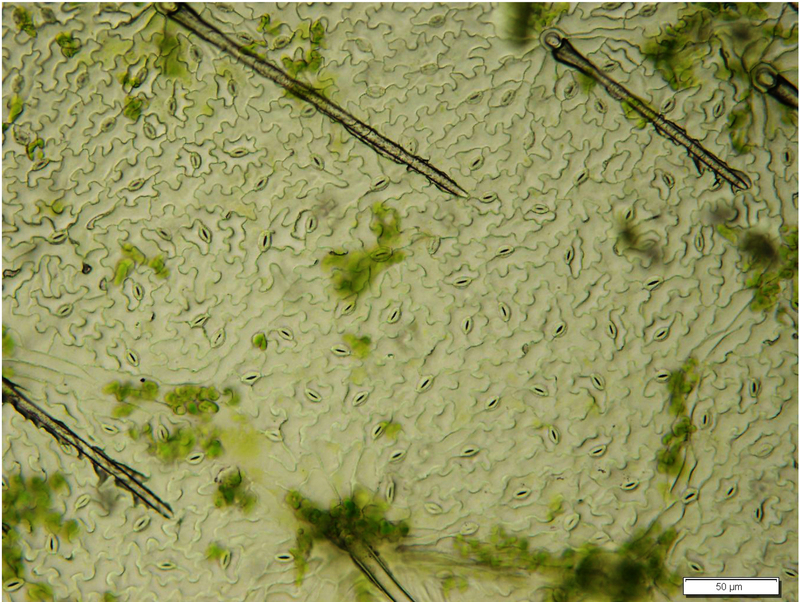 Leaf (tobacco) epidermis was imprinted onto agarose and screened under the optical microscope. 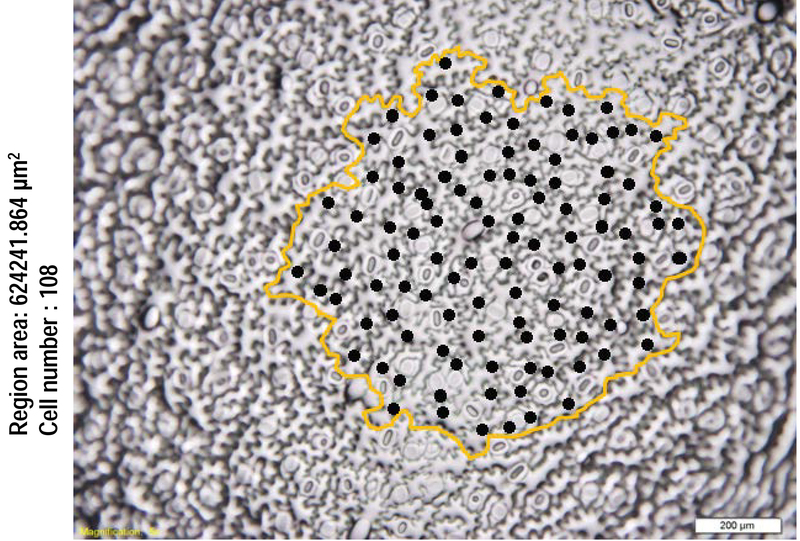 The polygon with yellow edges indicates a selected area for measuring the cell size of a leaf part. The black dots are marks (created using the Paintbrush Tool in ImageJ) for counting cell numbers. Bar = 200 μm. Figure 4. Screening of leaf epidermal cells by tearing the epidermis. Leaf (soybean) epidermis was torn off using the scotch tape and screened under the optical microscope. Bar = 50 μm. Using the agarose imprinting method, the leaf blade must be flat and laid on the melting agarose very gently. Otherwise, some detail structure of the epidermis will be lost or even failed to be imprinted on the agarose. Using the epidermal tearing method, the mesophyll cells should be scraped gently from one side for one time only to avoid destroying the structure of epidermis. Young and flat leaves are better than old and rounded leaves for epidermis screening. This protocol was improved from the previously published studies (Mathur and Koncz, 1997; De Veylder et al., 2001; Tao et al., 2015). This work was supported by the National Natural Science Foundation of China (grant No.91317306) and the State Key Lab of Plant Genomics. De Veylder, L., Beeckman, T., Beemster, G. T., Krols, L., Terras, F., Landrieu, I., van der Schueren, E., Maes, S., Naudts, M. and Inze, D. (2001). 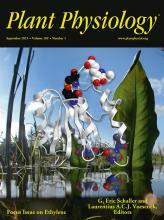 Functional analysis of cyclin-dependent kinase inhibitors of Arabidopsis. Plant Cell 13(7): 1653-1668. Mathur, J. and Koncz, C. (1997). Method for preparation of epidermal imprints using agarose. Biotechniques 22(2): 280-282.